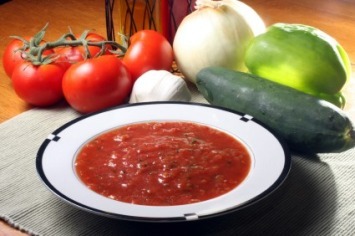 There is nothing quite so refreshing on a warm summer day as fresh a homemade gazpacho recipe. No need to cook over a hot stove for this recipe. Gazpacho is best made with sweet vine ripened tomatoes, rather than those pale orange globes we get in the middle of winter. Add a mix of red pepper, onion a touch of garlic and some herbs and you have quite a Mexican delight. In a large bowl combine the cucumber, pepper and tomatoes. Add the onion, garlic, tomato juice, olive oil, vinegar, salt and pepper and mix well. Add the chopped herb mixture and stir to combine. Refrigerate the soup for at least 2 hours or overnight. It is important that the vegetables are finely chopped or the mixture becomes more of a wet salad than a soup. Add a few dashes of your favorite hot sauce if you prefer a hotter version of this wonderful vegetarian soup. If you want your soup a bit less chunky, get out the blender. You can use a hand blender right in the mixing bowl or put the soup into a regular blender and blend until it is the consistency you prefer. Use extra virgin olive oil for this recipe, as the taste of the oil really does make a difference. The splash of red wine vinegar adds a nice touch of tart that really kicks the flavor up a notch. You can also add your favorite hot sauce if you prefer a little heat in your cold soup. Got a garden? This is a wonderful recipe to use up some of that extra produce that all seems to be ripe at the same time. It is a wonderfully healthy soup too with fresh vegetables and a nice kick of flavor. Here’s a great light Mexican dinner idea – gazpacho with taco salad. Find our recipe here. All of our Mexican recipes are here.